We’re thrilled to feature Jennifer Fisher as one of our badass #BOSSLADY mamas this week. 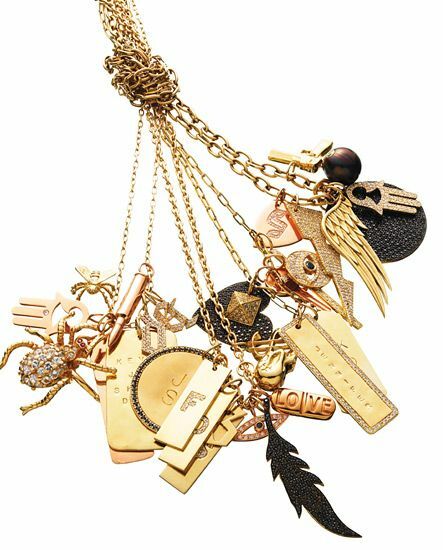 You have probably seen her statement jewelry pieces dripping on notable celebs like Rihanna, Beyonce and Sarah Jessica Parker to name a few. Fisher began her career as a stylist for 10 years and after the birth of her first child, Shane, Jennifer began to look for a piece of jewelry that not only spelled his name, but wanted something that expressed her own personal style. After scouring the jewelry scene at upscale designer stores, she was unable to find anything, so she took matters into her own hands. She designed a piece with Shane’s name stamped on the front that she styled with a long, thick link chain. Soon after, there was so much demand from friends, family and strangers to design one for them and boom, that is how Jennifer Fisher Jewelry was born in 2005. The mother of two to son Shane (age 11) and daughter Drew (age 10) is the epitome when it comes to major entrepreneur #momgoals who not only dresses to the nines, she is a true inspiration when it comes to balancing her successful jewelry line and family. If you’re like us and follow her on Instagram, you will see that she loves to cook, shares a glimpse of her glam life and knows how to vacation. Her and her husband Kevin, who is also her business partner, just celebrated their 15th wedding anniversary. How do you juggle a successful career with being a wife and mommy? What do you love to do when you have a little mommy-time to yourself? Its not a choice I just do it daily. I have had this business since Shane was born so I know no other way to parent but to constantly juggle and multitask. It’s our life and the kids are well adjusted to it. They know that I will be there for the important events and every AM and nights always for cooking them dinner before I go out if I have an event. Kevin my husband is a huge support and now that we run the business together, the work / home balance is even easier add he is around more to help. Honestly I cook whenever I can as it is my favorite thing to do. And Hot Yoga. I have recently changed my work schedule to accommodate my yoga. You need to find time for yourself. Being a jewelry designer, what is a jewelry staple every woman should own in their jewelry collection? A JF Customized charm necklace! They are the new modern heirloom piece every woman should own. People collect charm necklaces now to represent their life on a chain. My original was made to represent my children. Once they buy a charm (s) they continue to collect and build on them and can pass the charms down to their children later in life. We even have a new Charm Builder on our website so you can play around and build your dream necklace and see what it will look like. You can buy it all at once of save the image and collect them over time and special holidays. We even have a registry for husbands so they can just call and order based off of your wish list we keep on file. We love your jewelry line!! What are your favorite pieces from your latest collection? Where do you get your inspiration from? This latest collection of brass was all about my “Roots” in the fashion industry. There is a more industrial component and a more organic component to the collection. But right now its all about statement earrings and Hoops Hoops Hoops! We introduced the Samira Hoops a few seasons ago after my friend and fashion editor at Elle Samira Nasir. They are a best seller for us. And for the fine jewelry the new colored enamel is trending. People always wanted me to add color to my collection and kept asking me to use semi precious stones and it never felt right. With the enamel we are able to create custom colors that embodies the brand. Charcoal Gray, Tomboy Pink, Camo Green etc. We love Mexico, but just got back from the Dominican Republic with the kids renewing our wedding vows and it was amazing. The kids are older and we really can travel anywhere with them now. We know you are a beauty junkie like us! Name 3 beauty products you can’t live without. So funny. Im obsessed. I cannot live without my Tatcha One Step Camellia Cleansing Oil, Strivectin Neck Cream and Glossier Bounce Serum. Where are your favorite places you love to shop for your kids? Drew has a love for fashion like I do so I love shopping high/ low for her and mixing. I shop at Zara (they make the best Mini Me Looks…bombers and boots etc) and TRICO FIELD, a Japanese retailer with locations in LA and NYC that has the most amazing tees and sweats. For Shane it’s more about Sport Fashion and it’s all about the new Nike sweats and filling in with Supreme sweatshirts etc. We love your food posts on Instagram! What are some of your favorite restaurants in NYC to dine with your kids? Obviously if you follow my social media you see that I am always at Mr Chows in Tribeca. They make special food for me being Gluten Free and Low Sodium. We also are huge BBQ lovers and are always trying new places in the city. For Pizza its Rubirosa, For Pasta Its Bar Pitti, For Mexican its El Toro Blanco, Fresh Seafood and Sushi its Lure. All are kid friendly and amazing. I think you need to communicate clearly with your children and spouse. Obviously its easier as the kids get older to communicate clearly about work etc but I ave always been a working mom so Its just part of who we are as a family. You make it work. Sometimes not perfectly but we do our best. Be sure to follow her instagram @jenniferfisherjewelry and checkout her jewelry line here.